The Sri Lanka Philatelic Bureau of the Department of Posts has issued a new postage stamp in the denomination of Rs. 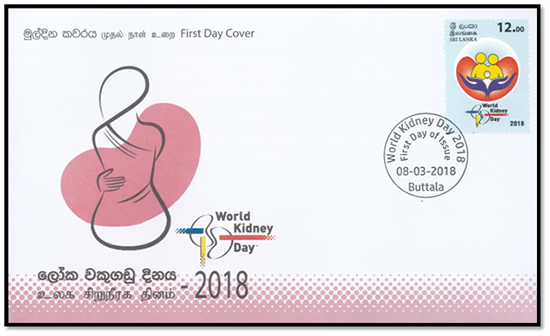 12.00 on March 08, 2018, to mark the commemoration of the World Kidney Day of 2018. The World Kidney Day is a global health awareness operation which highlights the importance of kidneys, the impact of kidney-related diseases and the related global issues. 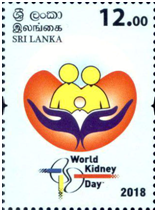 The annual World Kidney Day is commemorated on the second Thursday of March in each year. Initially the global commemoration of it began in the year 2006. Although it is possible to control the kidney disease by diagnosing it in advance, the general public lacks an understanding of this disease. Therefore, taking action for enhancing awareness among the public regarding the contributory factors for the prevalence of kidney diseases and the preventive measures to be taken through the operations undertaken on this day is done by giving it a global priority. The 8th of March, 2018 has been declared as the World Kidney Day by the International Nephrologists Association and the Kidney Foundation based on the theme Kidneys & Women’s Health which is the theme of the Kidney day of 2018. The kidney disease identified for the first time in the decade of 1990 in this country has by now spread in about 11 districts in Sri Lanka. Although it was initially identified that males are more prone to this disease than females, according to Health Ministry sources, the higher tendency of the spread of this disease among women and even children poses a severe challenge when he future of the country is concerned. Having identified the challenging situation that has emerged and with a clear vision to intervene in this regard, steps were taken by His Excellency the President to establish the Presidential Task Force on the Prevention of Kidney Diseases by coordinating various related institutions in order to save the public from this disease. The Presidential Task Force on the Prevention of Kidney Diseases is engaged in a number of activities in collaboration with a number of government and non-governmental organizations under the direct supervision and guidance of His Excellency the President by paying more attention to save the public of this country who are severely affected by this disease. Programmes are under way in the following areas with the participation of institution which are mainly engaged in preventive activities relating to kidney diseases including the Ministry of Health, Nutrition and Indigenous Medicine.